Summer 2015: 2L Farms will be at the Leavenworth Farmers Market again this year, on Saturday mornings. Come get your favorite jams and jellies as well as our 100% grass-fed beef! 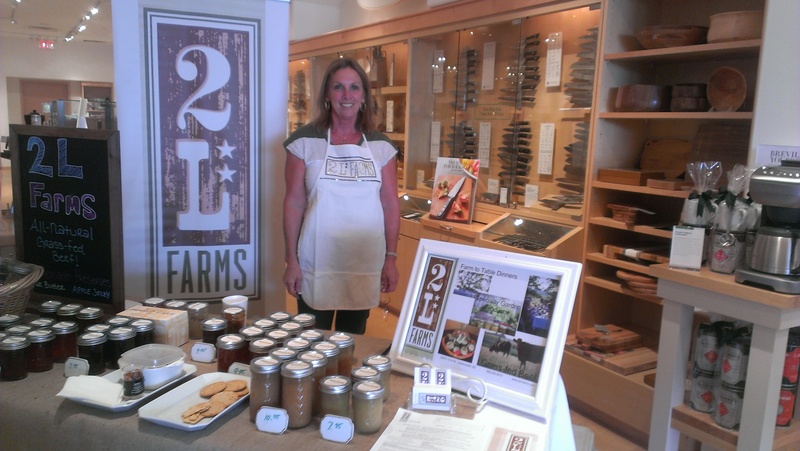 MAY 2014: 2L Farms is again featured as one of the local artisans at the Williams-Sonoma Artisan’s Fair in Leawood, KS. 100% grass-fed ground beef is available as well as our specialty jams and jellies. This month also kicks off this year’s Farm-to-Table dinner events. First one is May 18th, which is already sold out. If you haven’t gotten your ticket and experienced this back to your roots foodie event, check out our Dinners page. Tickets are still available for September and October which usually provide us an abundance of harvest from the garden that can go directly to the table. Come join us for a dinner event you won’t soon forget. APRIL 2014: Spring beef processing time. Beeves have gone to the butcher and are dry aging to capture that intense and delicious grass-fed beef flavor. If you ordered beef, we’ll be contacting you as soon as it’s ready for pickup / delivery. Get your grills ready!!! MARCH 2014: Join for us at Williams Sonoma’s Artisans Fairs in Leawood, KS, on March 1, April 5 and May 3. We’ll have several of our featured jams / jellies / sauces as well as grass-fed beef available for sale. JANUARY 2014: Get ready folks….we’re offering some great discounts on our 2014 Farm-to-Table dinner events, jams and jellies, and 100% grass-fed beef ONLY on KANSAS DAY, January 29th! So come back on Wednesday, January 29th, and you can save some real dough while experiencing the source of your food, some great garden delicacies, and some nutritious 100% grass-fed beef. We have four Farm-to-Table dinner dates from which to choose: May 18th, June 8th, September 7th, and October 5th. We’ll also be offering our famous Pear Butter, along with our Blueberry Glaze, Peach Basil Jelly, Raspberry Mango Jam, and our very savory Tomato Caponata. And to top it all off….discounts on our gourmet whole-cow ground beef (in two pound packages), which includes all the prime cuts of meat, as well as discounts on our bundles, sides, and wholes. Can’t use a side or whole? Find a friend or two and split it to save even more dough. Remember, our bundles come in 10- and 20-pound sizes for those with smaller needs. Don’t forget, come visit us here again on January 29th for all the deals!! NOVEMBER 2013: Our 2013 Farm-to-Table dinner season is over and we can’t thank our guests enough for sharing it with us. We hope you enjoyed it as much as we did! Currently we’re processing pears into our specialty pear butter and some other special items. Cheryl has harvested her “ton” of sweet potatoes and now has most of them stored in the root cellar until we determine which recipe(s) we like the best to produce for your kitchen cupboard. We are currently processing a steer and meat should be ready around the end of the month and garlic is in the ground for next year’s harvest. Winter is our planning time, so we’ll soon be interviewing chefs for next years’ farm-to-table events and getting lost in seed catalogs to determine next year’s garden varieties. 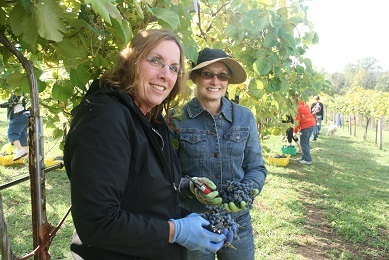 AUGUST 2013: Last September Cheryl and Terri spent some time visiting local vineyards determining which wineries we could partner with for our farm to table dinners. 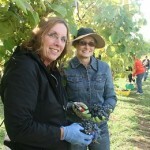 Some of the visits included harvesting parties! It was truly an educational and fun experience that ended with lunch and a wine tasting. This picture was also the front page of their recent newsletter. 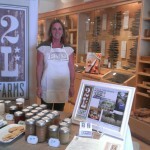 AUGUST 2013: 2L Farms was one of the featured local artisans on Saturday, August 3rd. We sold the remaining grass-fed ground beef and almost all of the roasts we had available. If you’re interested in Pikes Peak, Chuck, or Rump roast, let us know ASAP…before it’s all gone! We are proud and pleased to work with Williams Sonoma as they feature local artisans and their products as a part of their artisan product line and encouraging “buying local”. 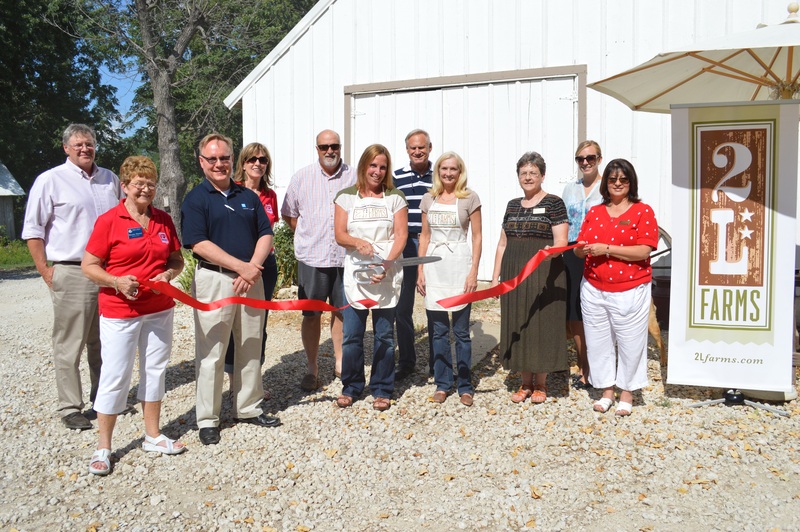 JULY 2013: On July 18th, Leavenworth/Lansing Chamber of Commerce hosted a formal ribbon cutting ceremony for 2L Farms right on the farm. 2L Farms served Fresh Lemon Bars with their Blueberry Glaze, Strawberry Lemonade, Pinot-Noir Cranberry Meatballs made with our own grass-fed beef, and goat cheese with 2L Farms’ apple jelly served on multi-grain crackers. So….now we’re official!! 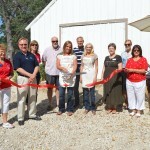 We took the opportunity to showcase our farm-to-table dinner events. Our fam-to-table dinners feature a cocktail hour with passed hors d’oeuvres. You’ll then enjoy a plated, four-course dinner featuring our grass-fed beef as the main entree. Each course is paired with a wine/cocktail/ or beer. Dinner is served atop the bluff overlooking the Kansas hillside and beautiful sunsets.